A week ago, Liverpool pulled of its fourth consecutive win, an exciting victory against Tottenham Hotspur, to give fans hope that, somehow, someway, the Reds would find a way to grab a surprise fourth-place spot in the Premier League table. On Saturday, Southampton – a team that is battling to stay out of the relegation zone – pretty much shut the door on that hope, posting a 3-1 win before a record Premier League crowd at St Mary’s of 32,070. The loss drops the Reds seven points behind fourth-place Chelsea, which has two games in hand. Even if Liverpool were to win out, the most points they can finish with are 69, meaning Chelsea just has to win six of its final 10 games to keep Liverpool out of a Champions League spot. Liverpool fell behind 2-0 following goals by Morgan Schneiderlin (just six minutes into the game) and Rickie Lambert (who scored on a 25-yard free kick). Philippe Coutinho’s goal in extra time at the end of the first half renewed the hope, but Southampton shut out Liverpool in the second half and Jay Rodriguez’ goal at the 80-minute mark removed all doubt. So how did Liverpool come out so flat and lose to a team that is struggling to stay out of the basement? One that was coming off a draw with Norwich City (currently 14th in the table) and last-place Queen Park Rangers? It some ways the loss is probably not that surprising. 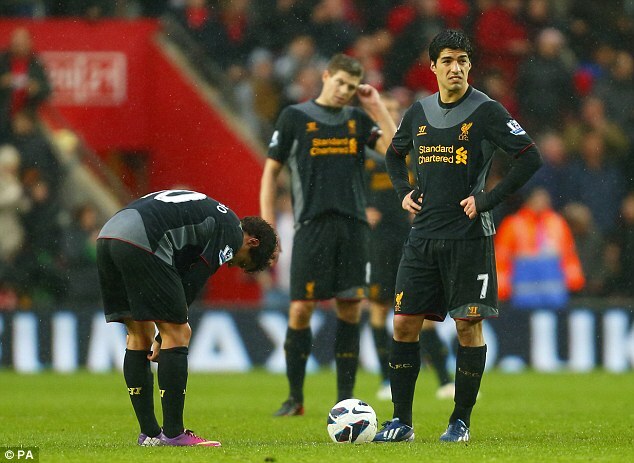 Liverpool is still has holes to fill and is far from a finished team and their inconsistency proves that. Rodgers is planning to ask team owners to pony up some cash over the summer, as he is reportedly targeting Newcastle’s Hatem Ben Arfa, Blackpool’s Tom Ince, Paris St-Germain’s Kévin Gameiro, Swansea’s Ashley Williams and Feyenoord’s Stefan de Vrij. Knowing the areas that need improvement is a good first step. Actually making that improvement, at least as far as this season is concerned, may prove to be a much more difficult task.